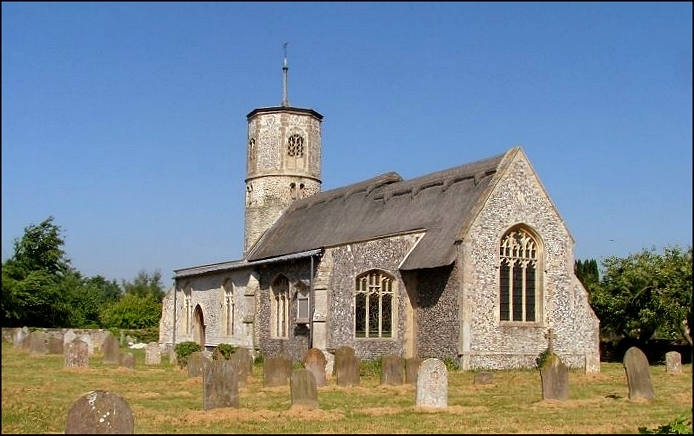 St Mary must surely be one of the prettiest churches in Norfolk - it would even give the churches of Suffolk, generally prettier, a run for their money. And the setting is delightful, too; at one end of the long village green, with cottages for company and a tight little graveyard just sufficiently overgrown enough to be beautiful. 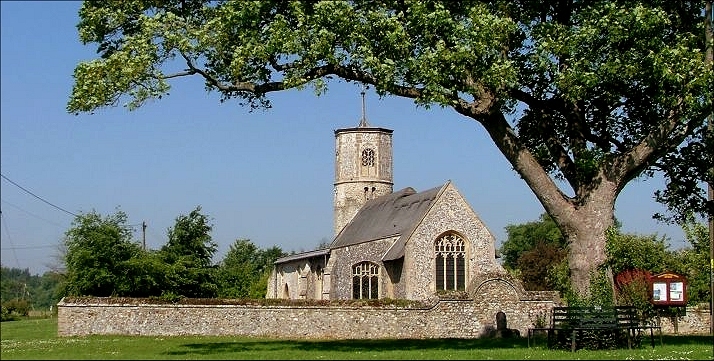 The village is a quiet place, because Beachamwell is off the beaten track, a few miles from the Downham Market to Swaffham road. No one passes through here - you only come to Beachamwell if you want to be here. Actually, that's not strictly true. The first time I came to St Mary, I hadn't intended to. I was on a bike ride with my 12 year old son, and he got a puncture. Foolishly, we hadn't got the means to fix it, and so we called up his mum to come and rescue him. She was enjoying a bit of peace and quiet, exploring the charity shops of Swaffham, but in her saintly and long-suffering way she agreed at once to come and save us. 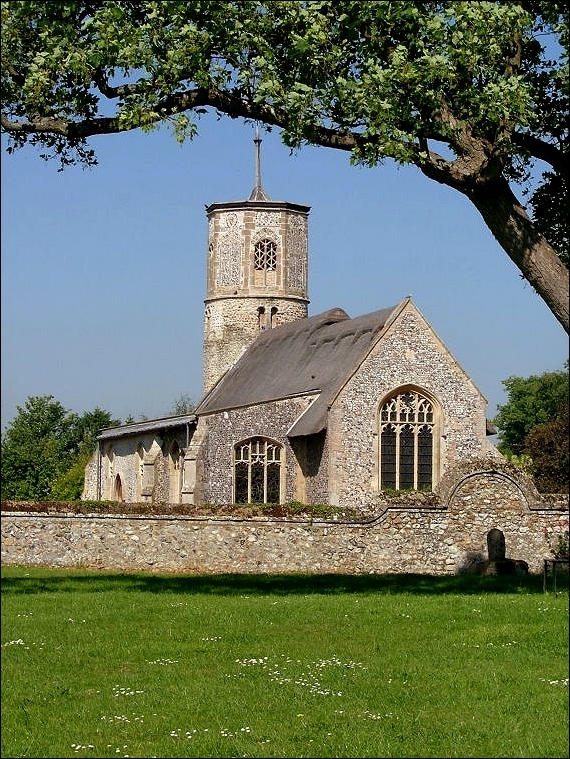 The nearest landmark seemed to be Beachamwell church, and so Jimmy and I sat in the sunshine on the village green waiting for her. I was tempted to explore the church, but it was locked. There is a key at the village shop, but on this Saturday afternoon the shop was closed. Another keyholder had a phone number - but down here in the village, unlike on the top road, I had no telephone signal. I came back a few weeks later on a Saturday morning, to find the shop open and a warm welcome. But I must still say that I can see no reason for this church not to be kept open during the day. 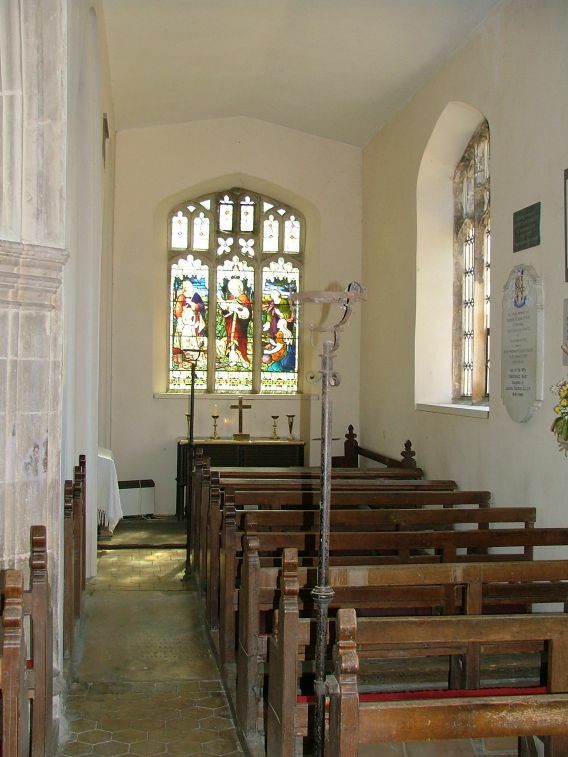 It is more than protected by being at the heart of its village, and it is one of the Diocese of Ely's flagship church tourist trail churches - indeed, inside there is a photograph of Prince Charles declaring the Diocese's project open in this very church some five years ago. 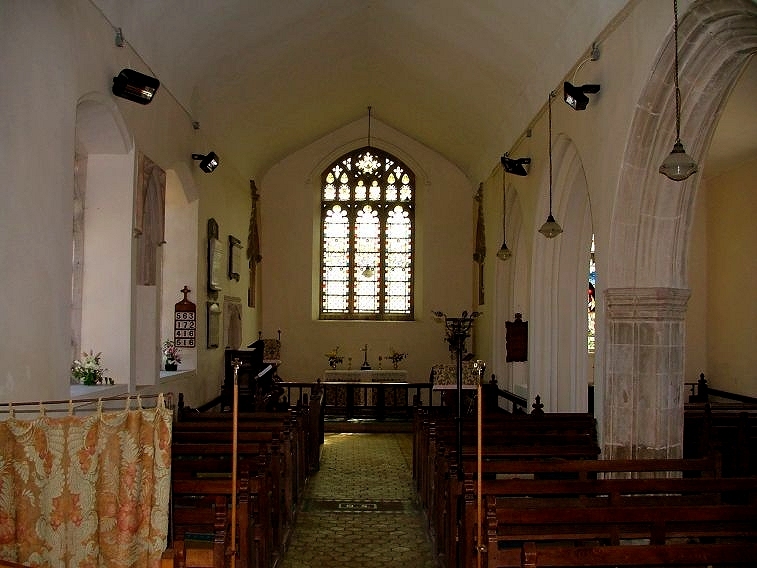 St Mary is the last surviving church of four that once served this area. It has everything a church needs to be beautiful. 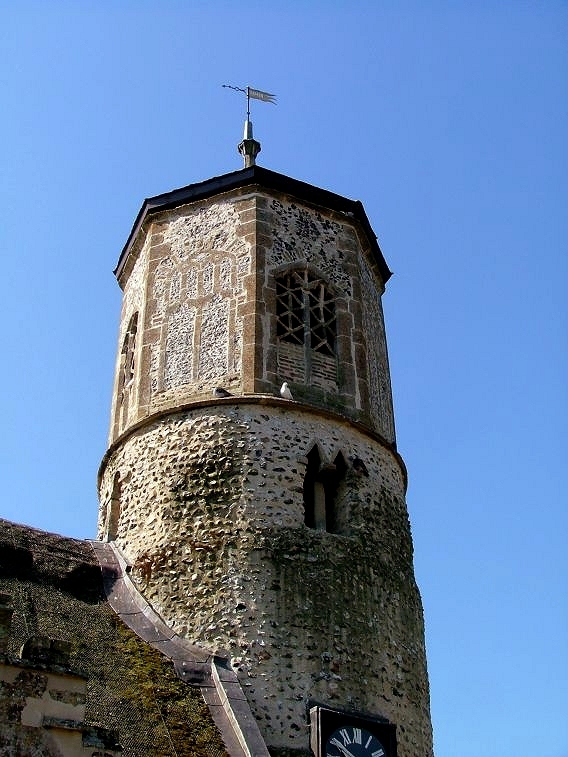 The round tower is one of the earliest in Norfolk, early 11th century; through the trapdoor in the ringing platform you can see right up to the top. 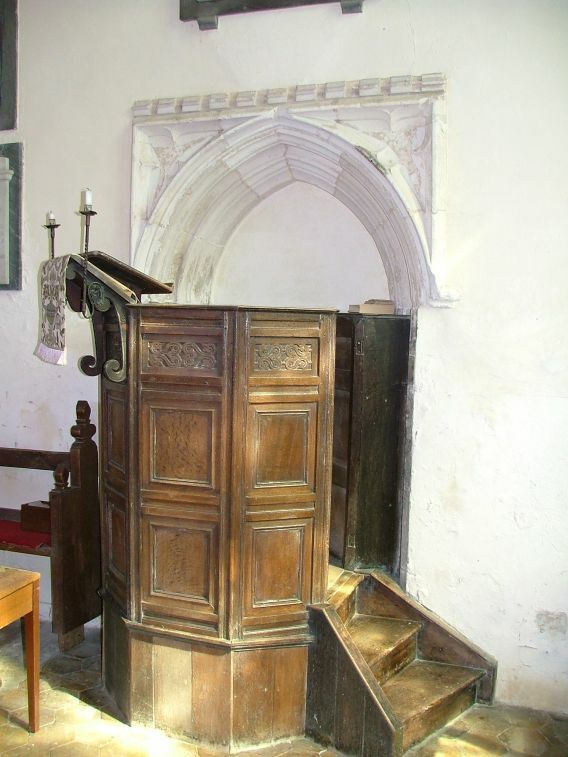 This is augmented by a gorgeous early 15th century octagonal bell stage, resplendent with flushwork. 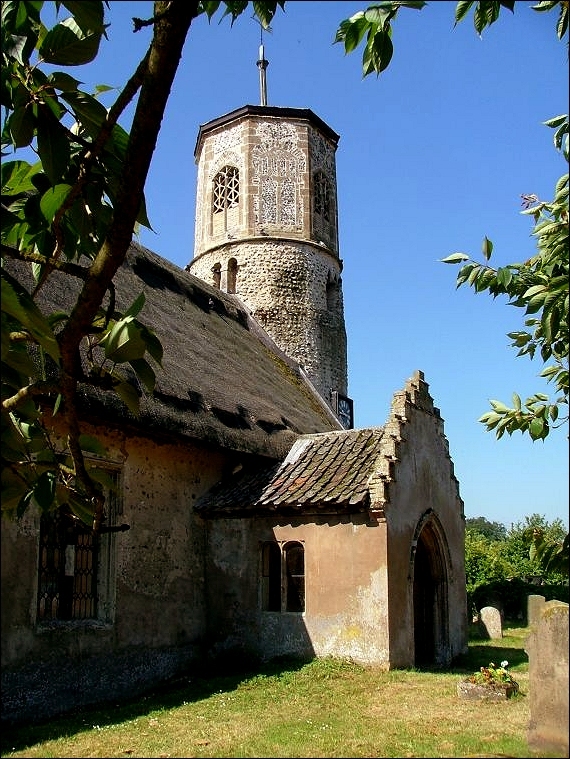 The church beside this is tiny, but has a lovely thatched roof to nave and chancel, with a south aisle tucked behind. 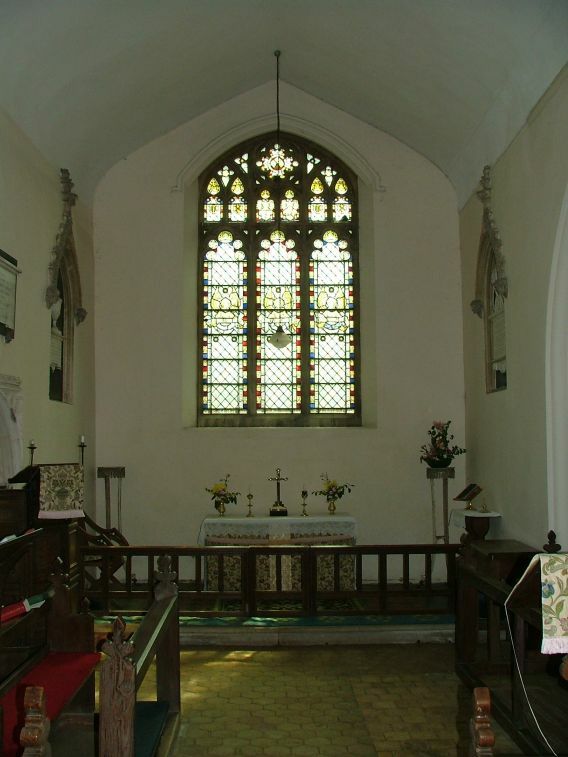 Inside, everything is plain and simple, a typical English village church. There is old woodwork, a small amount of 19th century glass, a white-walled space full of light. The Victorians were kind here. 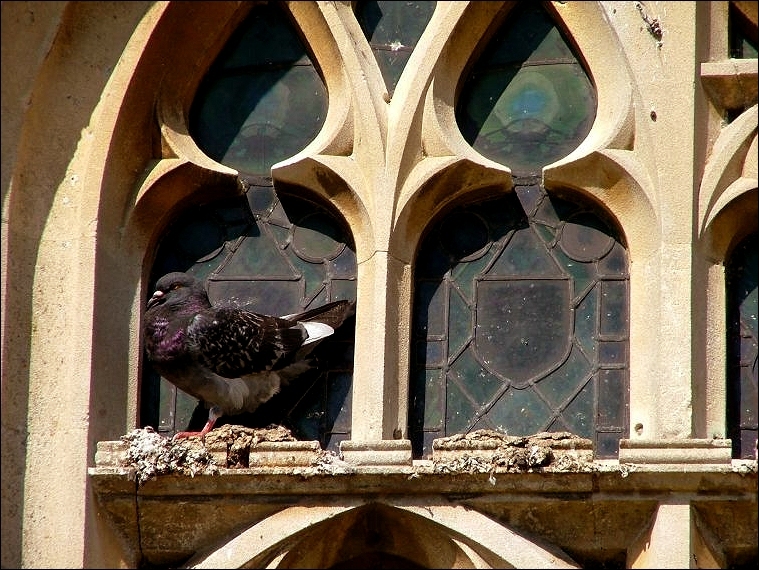 But St Mary is not without a few fascinating details. Firstly, in the north aisle chapel there is an extraordinary thing. 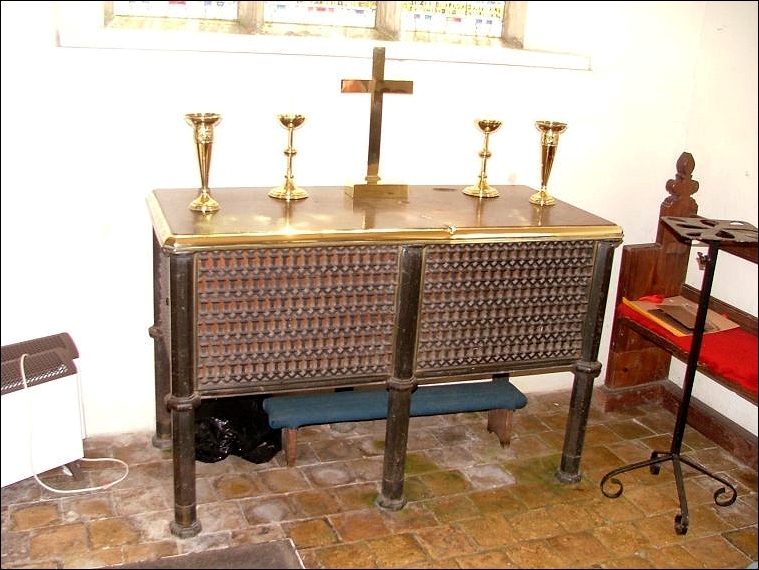 It is an iron and bronze chest altar on six legs, and I have never seen anything quite like it. 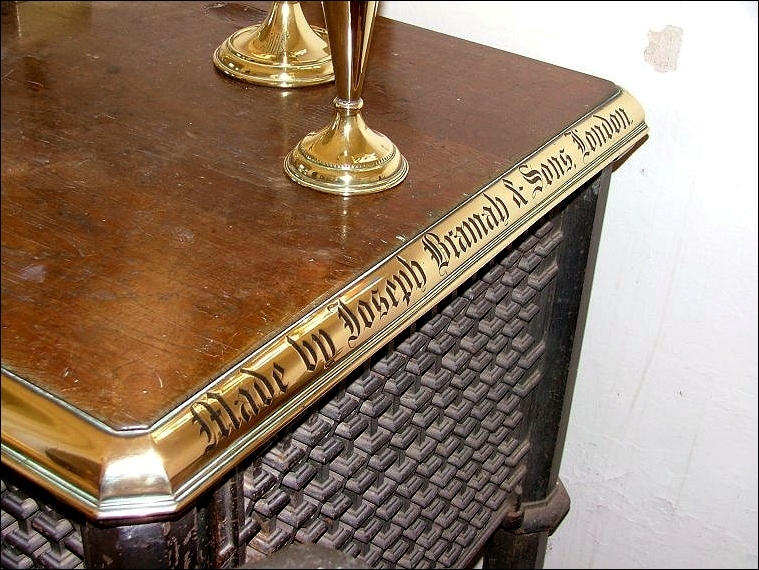 Pre-ecclesiological in style, it is dated 1835 in an inscription - Designed and Given by John Motteux... Made by Joseph Bramah and sons, London. My first thought was that this date was very close to that of the final Catholic Emancipation Act, and this altar might have been designed for a Catholic church - certainly, it would have been a very unusual Anglican church indeed that had an altar of this kind at that date, since the Oxford Movement was only just beginning to stir itself. Then it occured to me that the prominent inscription might be because the object was not intended for sale, but as an exhibition piece, and had only come to a church later. And then finally I remembered that the Motteux family were the Lords of the Manor, a local family. 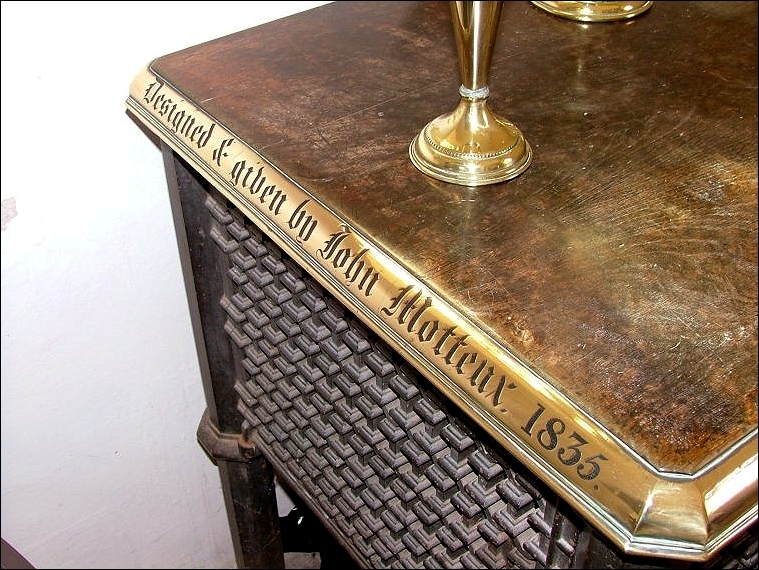 John Motteux restored St Mary in the 1830s, an extremely early restoration, one of the first in England. 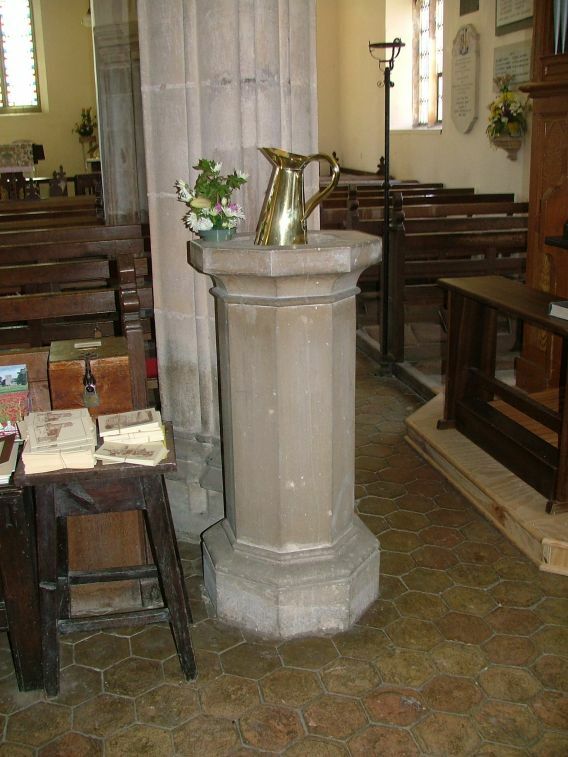 Another fruit of this restoration is the wholly secular pillar font, now at the west end of the south aisle. The Motteux family owned hundreds of acres of what must have been fairly useless land to the north of here in what was one of the poorest parts of rural England at that time. Eventually, the family gave the land away, and it was then sold to the Prince of Wales, who built Sandringham House on it, and brought the estate back from the dead. An intriguing touchstone to those times. 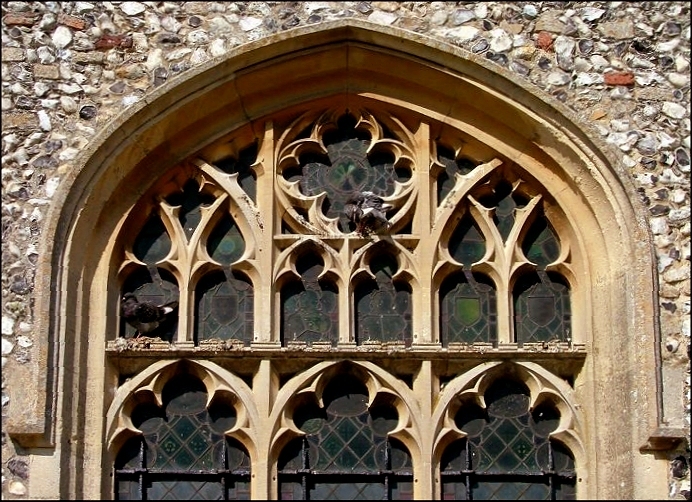 Secondly, in common with several other East Anglian churches, St Mary has graffiti on the arcade. However, the graffiti here is generally considered among the most interesting in England. It depicts a lady in a wimple, and a devil, in intricate detail. There are also some weights and measures in a list which appear to be some kind of reckoning table. Unfortunately, they are now so famous that they are kept behind perspex, which makes photographing difficult, but which will ensure their survival. A third intriguing detail is revealed if you walk up to the east end and look back. 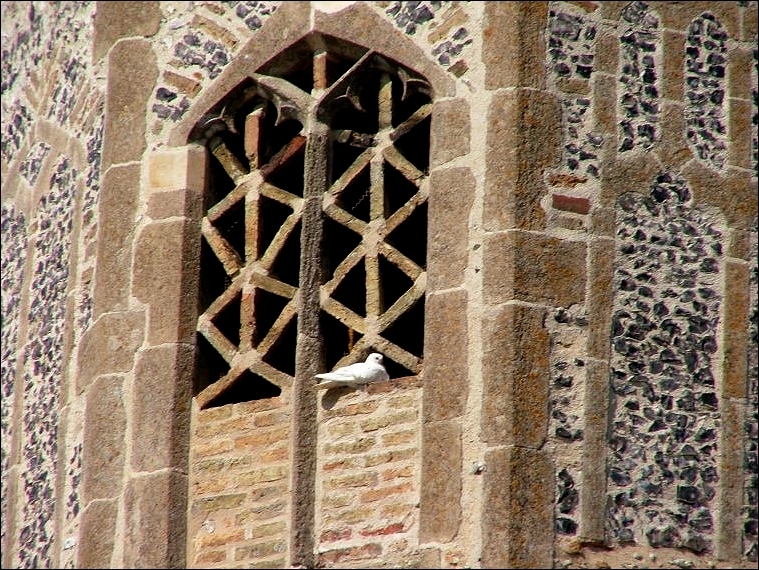 The sanctus bell window is off-centre in the west wall of the nave, and is curtailed by the ceiling of the roof. 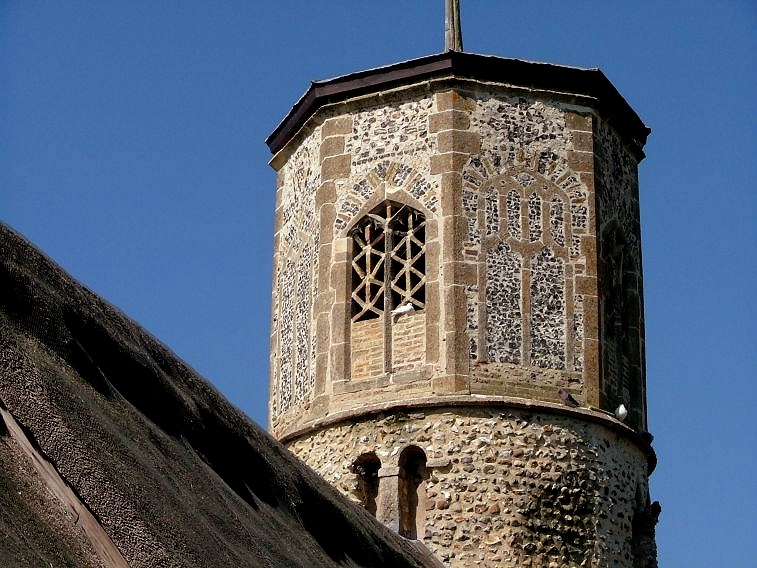 Now, there are a number of reasons why this might be - the ridge of the roof may not be central, the position of the window may indicate the line of a previous church, or there may be an obstacle inside the tower preventing it from being placed centrally. However, I think that none of these apply. The wall is as old as the tower; and, despite the lowering caused by the ceiling, the roof line appears to be original - or, at least, in the same place as the original. I climbed a ladder and peeked into the tower to find no obstacle. 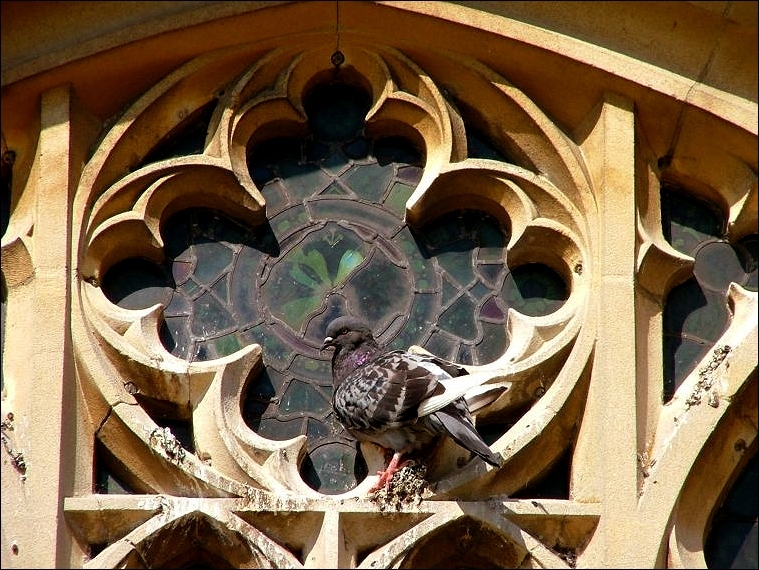 I think that the window may be off centre to allow a view into the chapel of the south aisle. 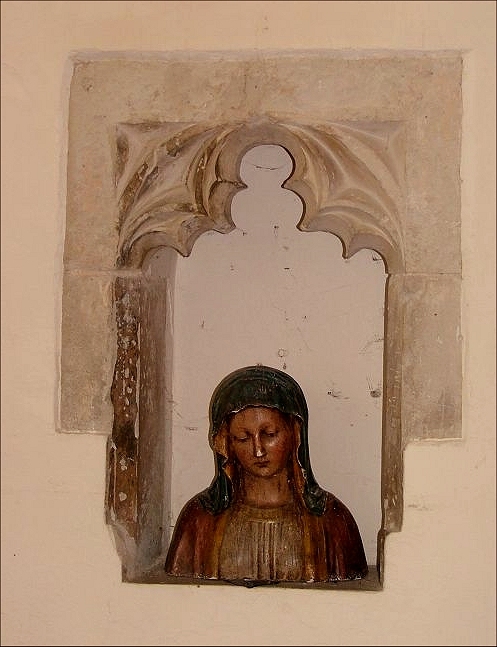 When Bloomfield came this way in the 18th century, he saw two alabaster devotional images here at St Mary. They had been discovered under the floorboards. One was of the deposition from the Cross, and was probably part of a rosary sequence (although Bloomfield would not have known that). The other depicted St Peter. Quite probably, they were both parts of altar pieces - but what if they were not from the same altar piece? If they came from Beachamwell originally, this suggests that there may have been an altar of some importance in the north aisle, perhaps even a shrine, and this required a sanctus bell to be rung just as at the high altar. 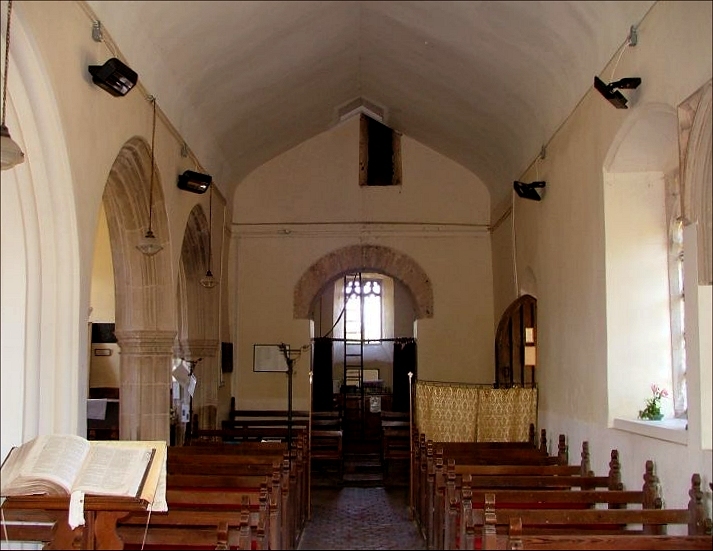 However, the situation is made slightly more complex by the fact that the east end of the aisle is obviously a later extension - you can see this clearly from outside. 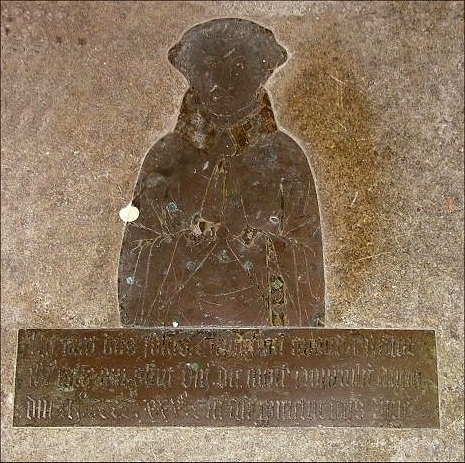 There are two good brasses, both to pre-Reformation Catholic Priests, now reset either side of the Victorian sanctuary. Perhaps they came from this church originally. 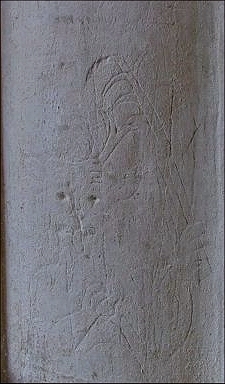 One memorial to a Priest that certainly did is on the north wall of the chancel. 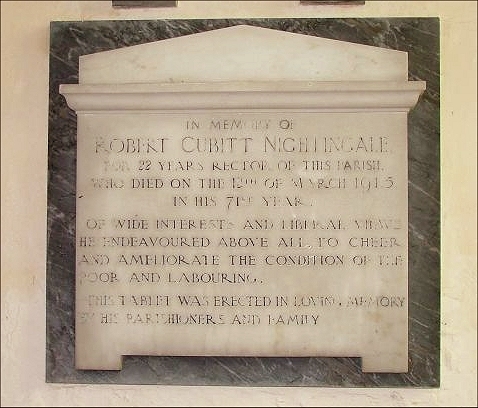 This is a strangely old-fashioned and rather moving memorial to Robert Cubitt Nightingale. He died in 1915, but it is written in a style that is almost 18th century: Of wide interest and liberal views, he endeavoured above all to cheer and ameliorate the condition of the poor and labouring. This would have been no small task in west Norfolk in the early years of the 20th century. As I have already noted, it was one of the poorest rural areas in England. It would take World War I to change this, and drag East Anglia into the 20th century - but at such a cost.